I am very off-and-on about how well I document my lessons. About once a month, I’ll frantically leave Google doc comments on everything and then forget about it for another month. I don’t remember this lesson (lifted almost directly from a lesson 2 years ago) going this well 2 years ago, but it felt like students were having solid conversations while acknowledging that some students had already learned formulas for area (and often couldn’t remember why they were derived the way they were) and some students were just making sense of things. Some days (when I remember, lately), you can’t even pose pictures as amazing as the ones the kiddos accidentally leave. There’s some thinking around the area of a circle and connections to half squares and formulas. Feat. the flyswatter from the flyswatter game (Show pictures of shapes on board. Say the name of a shape and watch the kiddos try to swat it. Get lovingly scolded by the Instructional Coach because the class next door can’t focus while your squirreliest class is celebrating victories over correctly identifying a pentagon versus a hexagon). To prepare for using coordinate geometry to find area and perimeter, we have to review area and perimeter. This is a nice chance to catch up the kiddos that weren’t here at the beginning of the year and review for many more kiddos who maybe didn’t fully understand the first time. It’s also a fascinating exercise into how long kiddos will draw boxes before using the base times height shortcut. Came back from a sub day (got to attend a meeting with fellow rookie math and science teachers) and went straight into two check-ins and a group quiz. After we switched groups (did I mention today was busy? ), kiddos pretty much got right to work. At Curriculum Partner’s suggestion, we did an opening about what groupwork looks like, cleaned out folders (sort of) and got to work. Kiddos got most of the class period to work together and talk through four problems. Problems are written so that kiddos fill in what they know – they get some basic information to get them started, but have to fill in steps or explain or pick and justify an answer, so that everyone has a bit of access, but still has to say what they know. Individual test tomorrow. So many projects still to grade. We’ll see how it goes. New week, new unit. Pythagorean Theorem is usually taught in middle school, but (again), it’s not a given that our students have learned it, so here we are. It also builds nicely on what we did with right triangle trigonometry. I should probably change seats today, but I feel like it takes the kiddos a bit to warm up, so I’m leaving them in the same seats for now. Which probably means we won’t change seats again. Because there are two weeks of content left to go. 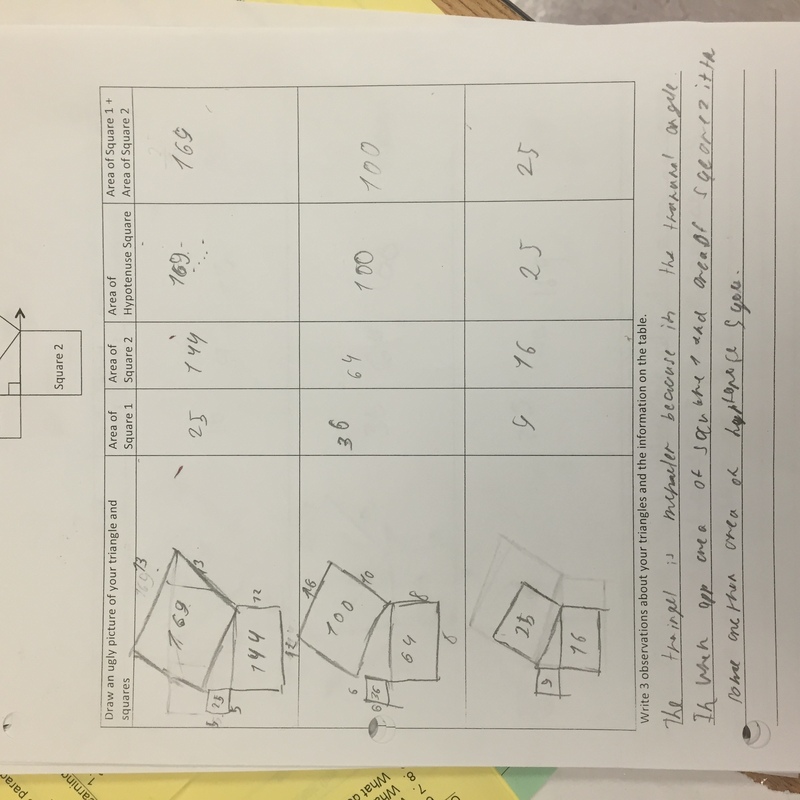 Photo 1: The Recording Sheet The idea behind today’s activity is that students use squares to make right triangles. Our first set of squares was too small and students build several right triangles that looked correct (4-5-6-nope), but weren’t. We spent 2nd period making the squares bigger and removing some of the confusing ones. One class tried to cut up the squares into smaller squares, but otherwise, this helped. This photo is from a group that worked steadily throughout the whole period. Most kiddos made the connection between the area of the hypotenuse square (as we’re calling it) and the sum of the area of squares 1 and 2. With both of these photos (and most of the photos I post here), I wish I could actually capture the groupwork that is happening. 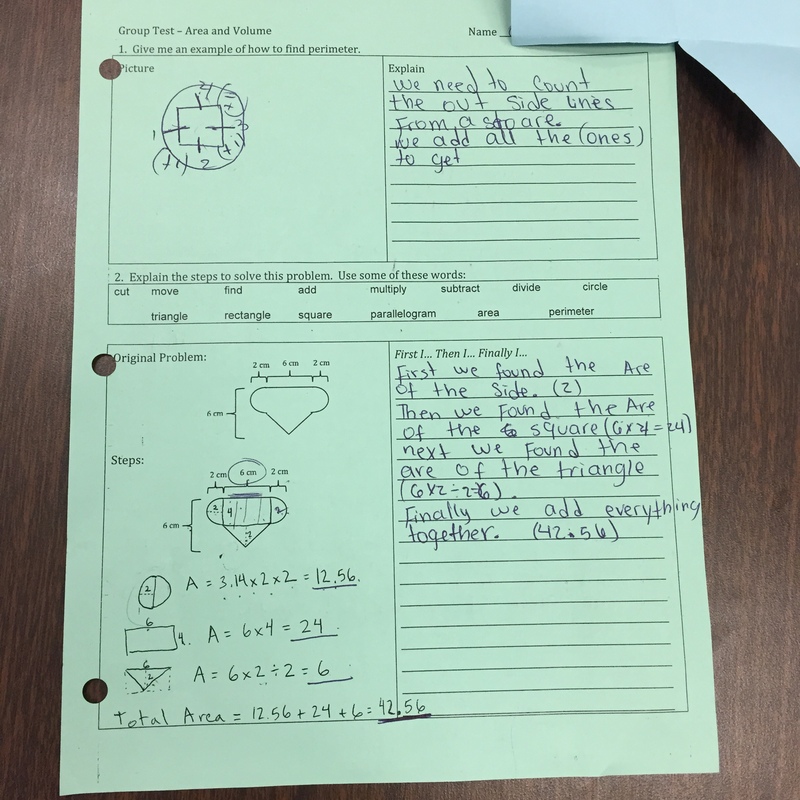 Kiddos who finished the triangles and squares activity worked on a practice area worksheet. We haven’t touched much on complex area, so these kiddos had to struggle their way through it (which is difficult and good at the same time). One of the high status students really struggled with this problem and a student, who would be considered a low status math student, saw how to adjust the height of the rectangle and tried to explain it. So cool to see. This photo doesn’t really do it justice. 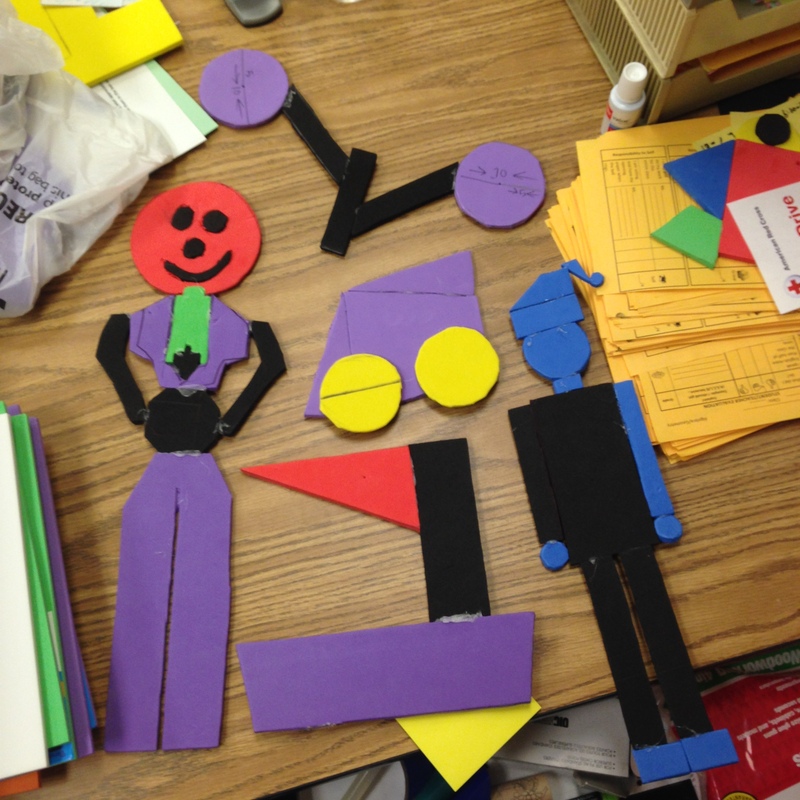 More work on the Mobile Project today (recap: students choose an object, identify the shapes, and create a mobile object with an area of 200 cm squared. Sound easy? Yeah, that’s what I thought, too). Students started at all stages of the project today and I’m not sure if we’re closer or further together now. One class feels further behind, two feel like we’re making progress and one…I don’t know. Today’s picture(s) show various stages of the project. 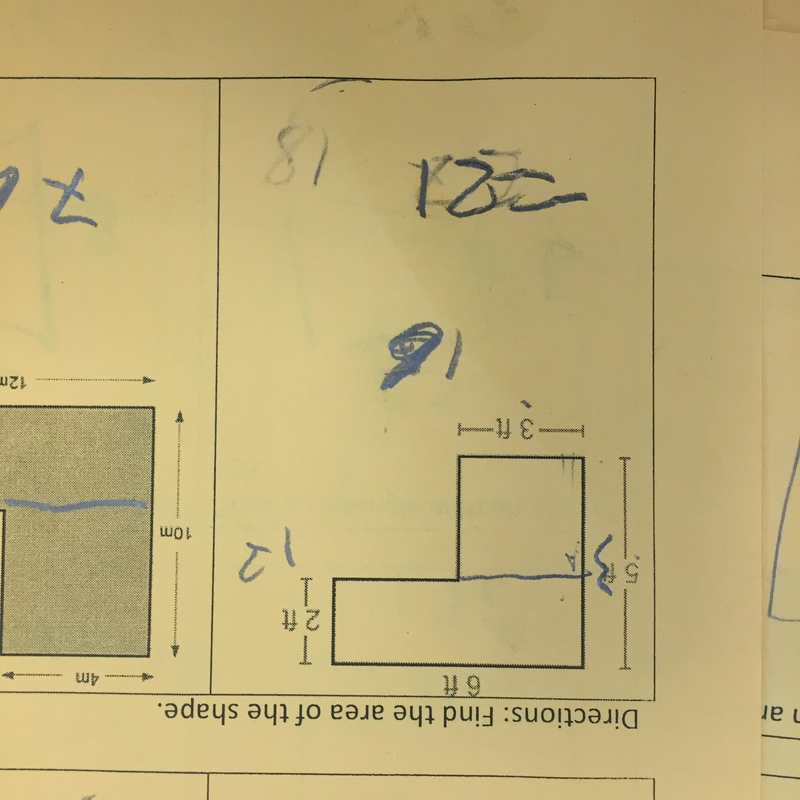 The yellow picture is a drawing of a house that one student (who was absent for a bit and is frequently distracted) drew today. I’m pretty pumped for them. The yellow person is the stage where the student uses a grid to show that their object (the person) is 200 centimeters squared. Right now the person is 60 centimeters squared. I think they can do it, even though we have extremely short periods tomorrow (40 minutes instead of 65 minutes). This student is also easily distracted and I’m psyched they got this far today. The green and blue truck is actually a tree-truck created by a pair of pretty spunky students. They’re from yesterday’s Dark Horse Class, which has the most finished objects so far. 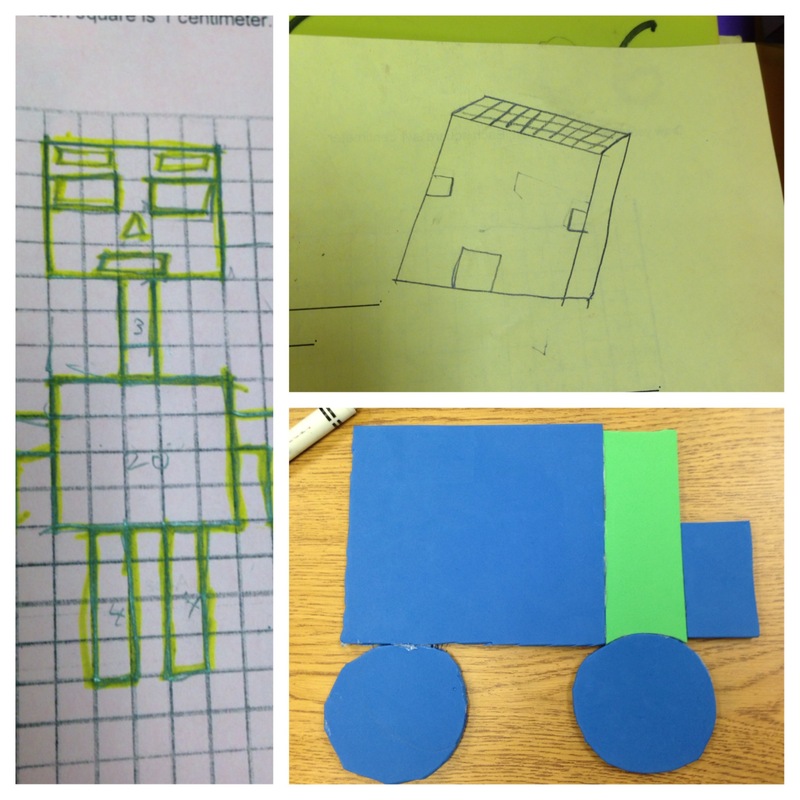 These kids started out wanting to create cars (We’ll make cars! And motors! ¿Còmo se dice “llantas” en ingles?). After struggling valiantly all of yesterday, they came up to me holding the green rectangle and blue circle at the right five minutes into the period today. “We made a tree!” they exclaimed. So they enlisted their friends to create a truck (’cause Complex Instruction). This was in the midst of kids running around with glue guns, a giant box of foam, a pencil sharpening accident and a referral. “We made a truck!” they exclaimed about 20 minutes later (their friends watched, too). I never know which of my classes will surprise me. It was a struggle throughout the day. Then, all of a sudden, my last class (the one that was furthest behind) pulled out of nowhere; five students finished their portion of the mobile. Kind of a nice reminder that the kiddos will always surprise you. There’s still some tweaking and reflecting to do, but I had to take a photo as evidence. I wish I had a photo that showed the math (calculations, drawings, etc), but for now, this’ll do.